Jess H. Brewer's Home Page! My son Jed observes his freshly-minted sister Rebecca in the Seibo Byoin Hospital in Tokyo where she was born. 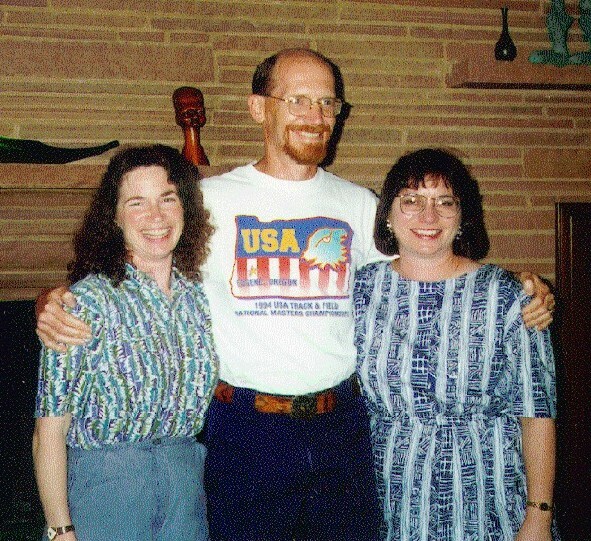 My sisters Lisa (left) and Carla (right) and me (middle) at Aunt Treen's house in Waco, TX. 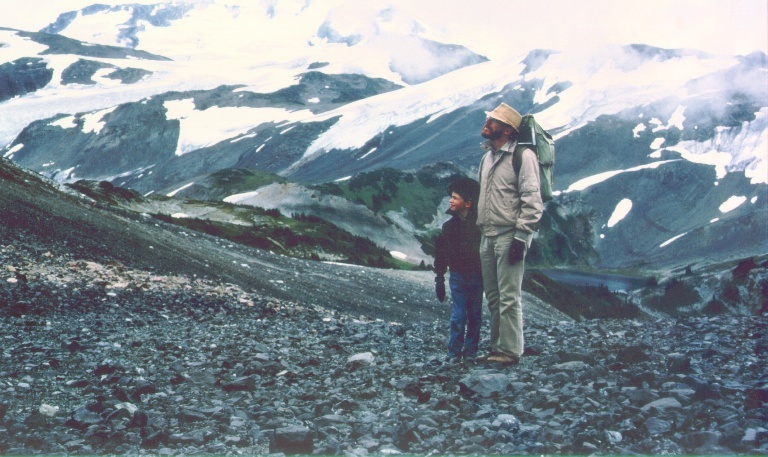 My friend Peter Ballin took this picture of me and Jed as we were climbing Black Tusk in Garibaldi Park, BC. 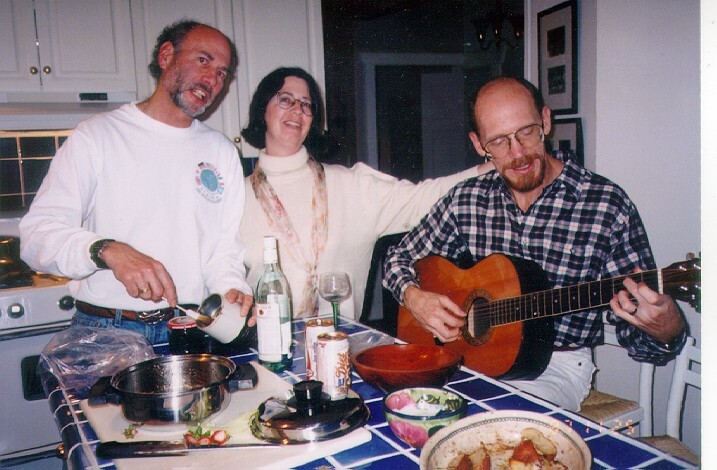 Here's Peter (on the left), my wife Pat Sparkes and me attempting to make music. Peter's wife Shirley is taking the picture (in their kitchen). For a price I will reveal the secrets of the ancient folk wisdom! TRACK & FIELD: please visit the Personal Page of my T&F Site at home. Enough recreation; let's get down to business. If you want to see an official outline of my research program, check out my research homepage. To inspect the details of what I consider my life's work (professionally), click on µSR. Are you interested in Physics? In 1996-97 I ran my UBC course Physics 200 (Relativity and Quanta) off a Web site using the lovely WebCT Course Tools developed by Computer Science jocks at UBC; you need an ID and password to get access to that site, but I am maintaining a public P200 Home Page for a subset of the course (like HyperText Handouts on various subjects) that anyone is welcome to peruse. In Spring 1997 I also put parts of Physics 455 (Statistical Mechanics for Engineering Physics) on WebCT. As for PHYS 200, there is also a public P455 Home Page if you're interested. As of 1998-99, there is also a Web site for the Physics part of Science 1. If you imagine that my personal tastes in Web sites hold any interest for you, feel free to have a look at the ones I have organized by topic (my own idiosyncratic list) in Jess Brewer's Web Map. You'd probably do better to go straight to DEC's AltaVista search engine, though. Better yet, try google.com ! If you are fond of elementary particle physics, you may also want to peek at my diagrams of Pion Decay and P-violation or maybe Muon Decay. Enjoy.